Dale and Hazel Workman celebrated their 90th birthdays with a surprise party Dec. 10 hosted by their daughter Linda and granddaughter Kelly. They received a lot of cards, from nieces, nephews, one sister-in-law, and friends. Hazel was 90 on Dec. 13 and Dale will be on Dec. 18. They have two children, Jim (Linda) Workman, Linda (Mike) Reese, six grandchildren, two step-grandchildren, 11 great-grandchildren, four step great-grandchildren and one great-great-grandchild. https://www.mydailytribune.com/wp-content/uploads/sites/42/2017/12/web1_90.jpgDale and Hazel Workman celebrated their 90th birthdays with a surprise party Dec. 10 hosted by their daughter Linda and granddaughter Kelly. They received a lot of cards, from nieces, nephews, one sister-in-law, and friends. 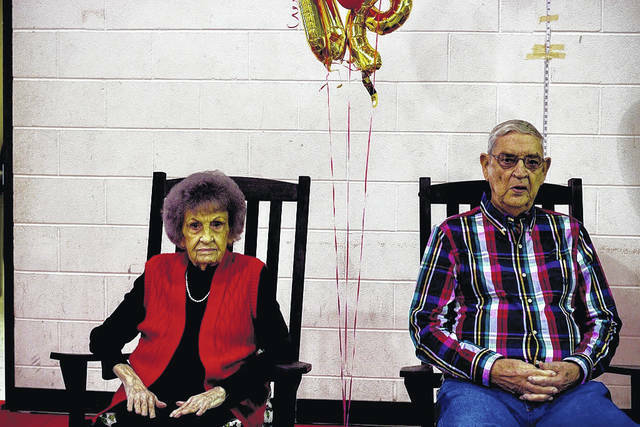 Hazel was 90 on Dec. 13 and Dale will be on Dec. 18. They have two children, Jim (Linda) Workman, Linda (Mike) Reese, six grandchildren, two step-grandchildren, 11 great-grandchildren, four step great-grandchildren and one great-great-grandchild.